Michelle Burke auctioneer & letting agent has brought two spectacular properties to the market. Lacklea in Barna is an impressive new build. It is just a three minute stroll to Barna village and a two minute stroll to the shore front with breathtaking views and walks. Designed by award winning architects Patrick McCabe & Co, this property has been constructed to the highest standard with excellent attention to design and detail. Extending to 3,600sq ft and accommodating three reception rooms, five double bedrooms, and three en suites, it is an ideal home for a young and growing family. The kitchen really has the wow factor with no expense spared to deliver a high-end, contemporary, cooking and dining experience. Smeg appliances are built-in and include double oven, microwave, dishwasher, fridge freezer, wine cooler, and a double Belfast sink. There is a centre island which houses the five plate induction hob with concealed extractor. At first floor level there are five double bedrooms, three with en suites, all with solid wood flooring. The master comes with exceptional panoramic sea views and a spacious walk-in wardrobe. The en suite has 'his and hers' sinks, oval bath, separate wc, and glass door to wet room. The main bathroom comes fully tiled with marble tiling, bath, and separate shower. It is clear that high calibre professional building and workmanship combined with superior architect design marry to make this the ultimate in a dream property. Price region: €975,000. Located in Bushypark, Boroondara is a charming 2,800sq ft residence set on a magnificent elevated site in a quiet cul de sac. The entire rear aspect offers stunning views of Lough Corrib and its environs and it is just minutes from NUIG and UHG with excellent national schools nearby. It is close to the five-star Glenlo Abbey Hotel and Dangan sports grounds, with pedestrian walks along the Corrib leading to the college and the Kingfisher sports and leisure complex. An entrance porch with stained glass panels leads to a grand foyer with solid oak flooring and onward to a formal lounge and raised dining area and a lovely sunroom with wraparound glass windows and patio doors. Additionally there is a games room and an informal lounge which offers the most wonderful views. The fine kitchen sits to the front of the property and comes with ample built-in units, top quality appliances, and free standing centre island. The utility with built-in units, stainless steel sink, and door to rear gardens is situated to the rear of the kitchen. A mezzanine level houses a superb, light, reading gallery and a covered balcony, an ideal place to relax, read, and enjoy the views. There are four double bedrooms at first floor level, three are en suite, and all come with built-in wardrobes and ample built-in presses and shelving. The 300sq ft master bedroom with en suite has three large picture windows, maximising the views which delights from dawn to late evening. The exterior of the residence is very well landscaped with mature shrubbery and trees while the rear and front patios are laid in Liscannor stone. Architect designed by Roddy Mannion & Associates, this five bedroom upmarket home would be a wonderful choice for a young and growing family. Priced very reasonably at €565,000, it must be viewed if calibre of location, views, and large, good quality living accommodation is required. 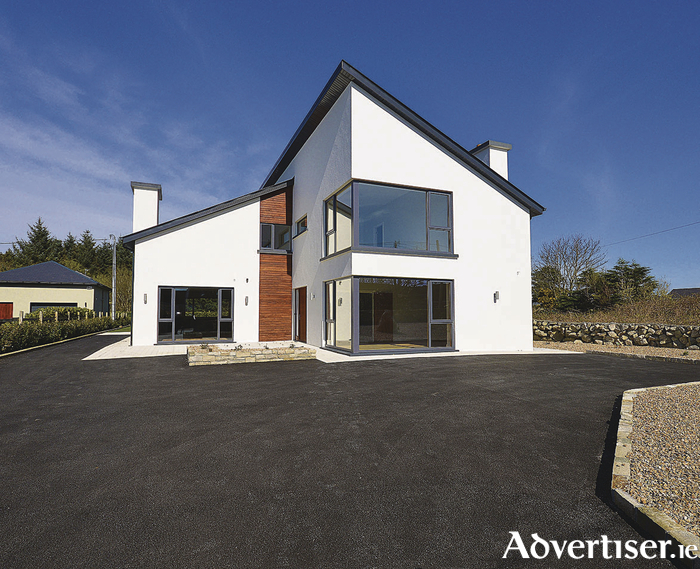 Contact Michelle Burke MIPAV on 087 2500716 or 091 868080 for further details or to arrange a viewing. (Viewings arranged six days a week up to 8.30pm ).